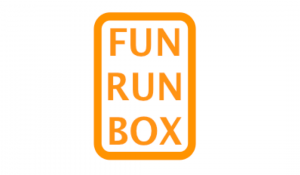 I am super duper excited to tell you guys that I was chosen from 100s of other applicants to be a Fun Run Box Ambassador for the next six month! I decided to apply on a whim because after finishing my 65.3 Viking Conquest fun run, I knew I was going to have to find something to continue my motivation of getting in to run mode. Next year I want to be able to run the entire length of the Mackinac Bridge for the Labor Day walk since we did not do the walk this year. They allow runners to do it and they get to start earlier. But, you cannot stop or stop to walk. Right now, I cannot run 5 miles without stopping. I’m getting there. I have some health issues that I battle, so I am happy with my progress and I am okay if I don’t get back to 10 miles like I used to do many years ago. One of my favorite things about the Fun Run Box is that the boxes are customized to you and your running level. If you are a walker and just starting out, there is a box for you. If you are an experienced marathon runner, there is one for you, too. Even though I do run, I decided to do the walker to runner beginner box. I felt this was the best option for me and would be just the push I needed to step up my running game. Your first box will be more of a ‘welcome to our challenge’ box. 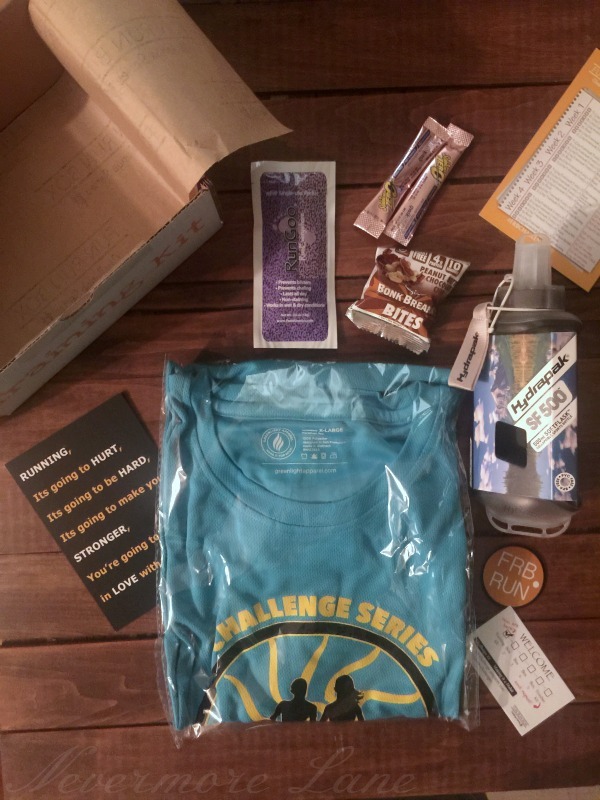 The challenge boxes will come with a Fun Run Box ‘In Training’ shirt made of that dry weave material. This shirt is AWESOME and really made me feel like I was part of the Fun Run Box team! 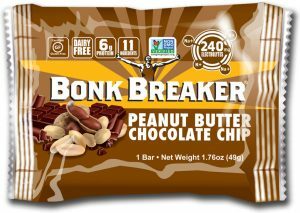 Bonk Breaker Bites : Peanut Butter Chocolate Chip – Dairy Free, Gluten Free. 4g of Protein. 10 whole ingredients. You guys! This reminded me so much of those homemade oatmeal peanut butter protein balls / bites you see floating around Pinterest. At first I was like “This is all I get?” But one bite and you will now why. These little guys are power packed. I can see myself ordering these to keep in my purse, my pocket when I am hitting pavement and here in my home office. These were #YUMEATING kind of good! 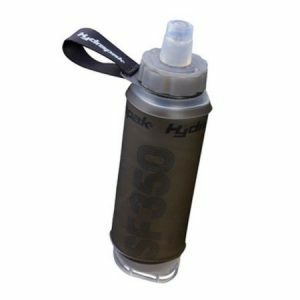 Hyrdapak – SF-500 Softflask collapsible sports bottle. Holds 500 ml of water. (note the photo is the 350 mil option.) This is probably the coolest water bottle I have ever owned. 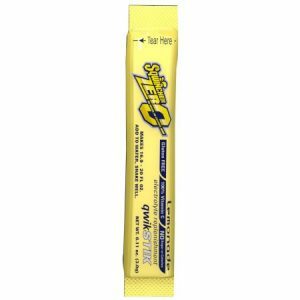 Easy to pack for hiking or backpacking and it’s really easy to hold. I hate trying to hold on to water bottles so I usually don’t bring them. This one has a handy loop for clipping. Pocket Welcome Card – Your first 6 months is Challenge 1: Making it a Habit. It has check boxes for Training Kit, month 2, 3, 4 and 5 and then a Finisher Kit for month 6. The first challenge prepares you for the future challenges. 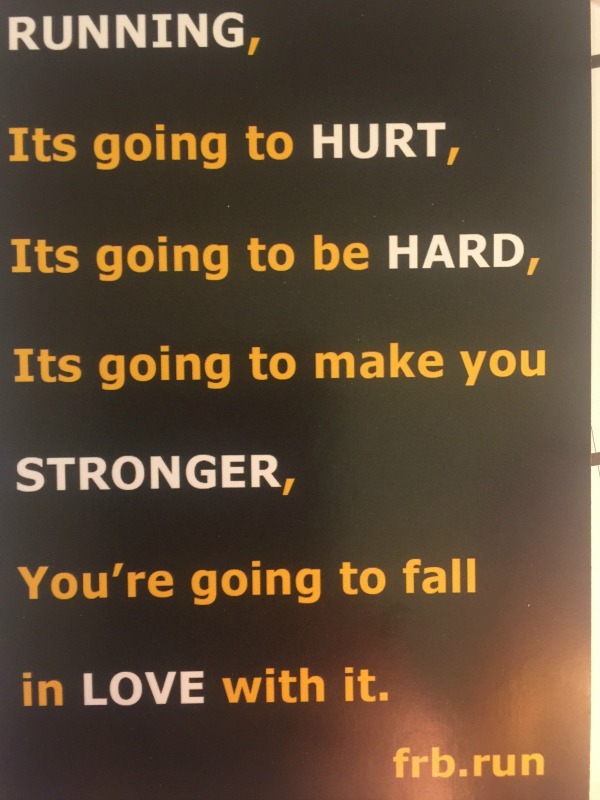 Motivational Quote Card – Running, it’s going to hurt, it’s going to be hard, it’s going to make you stronger, you’re going to fall in love with it. On the back is instructions for warm-up, cool down, Fartlek (speed play,) intervals (this is currently what I do with walk/run,) and tempo runs. Running, it’s going to hurt, it’s going to be hard, it’s going to make you stronger, you’re going to fall in love with it. 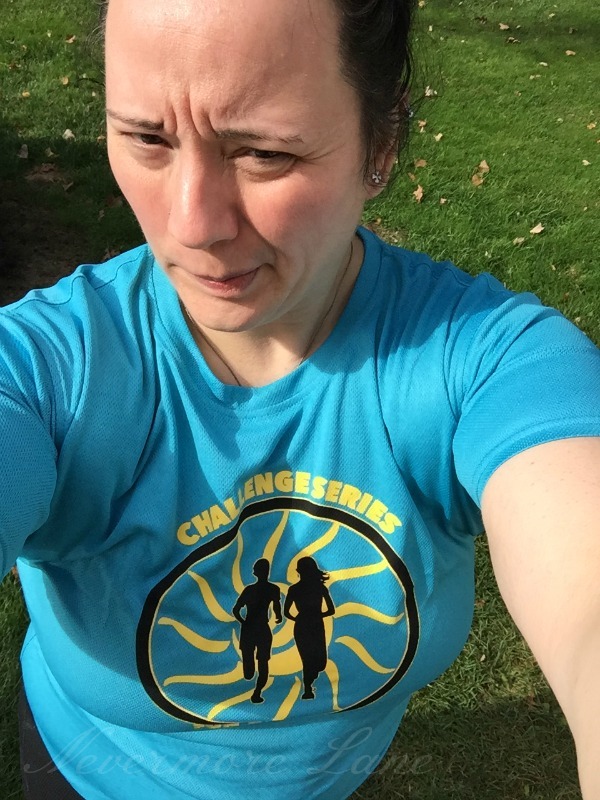 Challenge Schedule Card – the beginner schedule is set up similar to the C25k program where you up your run time every day. On the back is the Making it a Habit instructions and more motivation. The best thing about this box is that it is actually things you need and will use. Too often, in the past, I have purchased boxes and would end up with a bunch of stuff I had no interest in. Those things would just sit around and collect dust. I am trying to simplify life and keep things that bring me some sort of purpose. This box was not overloaded with treats. Just the right amount and all of the other products were things I will try and/or use. I love it! A box like this is just the thing to keep me motivated to run. Thanks for sharing this! This is such a great box! I’m a big runner, but sometimes I lose my motivation. This box could really change that for me. Awesome box. Running is all about motivation and pushing through. This box is good on both those counts. Super cool. You got a lot of great items. I really like the softflask collapsible sports bottle. That Hydrapak water bottle looks like it would be really useful. I love the idea of this subscription box. Perfect to motivate people into getting in shape. I don’t usually put fun and run in the same sentence. However, this box is full of good stuff for sure! This box looks like a great way to keep me motivated so I can achieve some fitness goals. I like that there”s not a bunch of junk that you’ll never get around to using in this box. Wow! Congratulations! These are great stuff! Perfect to keep motivated with your goal! Good luck! I would be very curious to try those bonk breaker bits! They sound interesting. The shirt is cool looking. congrats on your ambassadorship! I cant wait to see for the next 6 months what are in these boxes! How cool! It sounds like the ambassadorship would be a great way to stay motivated to set new goals and crush them. 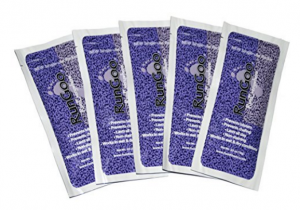 All of the products in your Training Kit will help you as your prepare. That sounds like the perfect subscription box for people who love running and it’s definitely something that will help motivate you. I love the items in it! I like subscription boxes. And how fun to have a collapsible bottle! What a fun subscription box. I love that no matter what our interests or hobbies are, there is a box tailored for us. Love that this one provides the motivation for you to keep running. Great job! A subscription box would be a great way to find out what works for your fitness journey. How fun!